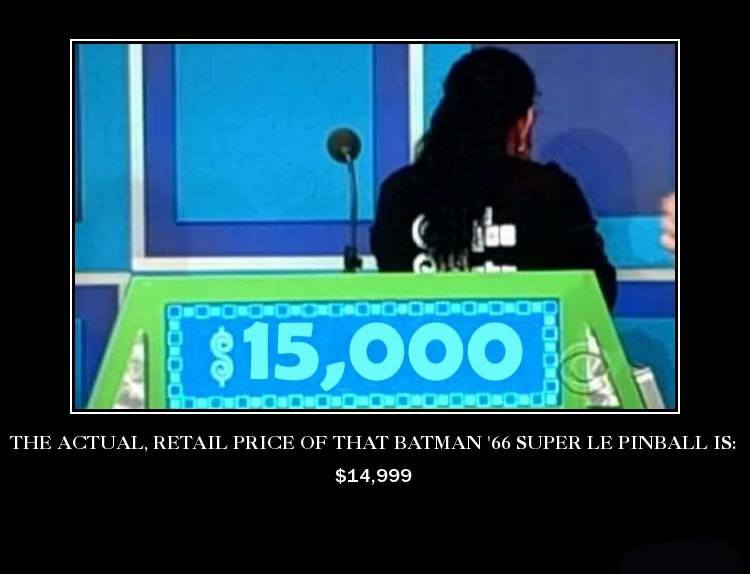 This contestant was not worthy of Batman ’66. Stern Pinball in Collaboration with Ka-Pow Pinball Celebrates 30 Years in Business with Release of Batman ‘66 Pinball Game! Holy Golden Anniversary, Iconic Batman TV Show Turns 50! ELK GROVE VILLAGE, IL – September 15, 2016 – Stern Pinball, Inc., the world’s oldest and largest producer of arcade-quality pinball machines, proudly announced today the availability of its highly anticipated Batman ‘66 Anniversary Edition pinball machine. “We are very proud to celebrate our 30th year in business by making a 50th anniversary Batman ‘66 game in collaboration with our good friend, Joe Kaminkow. Joe, who was instrumental in starting Stern Pinball 30 years ago and served as our company’s very first game designer, is now one of the gaming industry’s leaders,” said Gary Stern, Chairman and CEO of Stern Pinball, Inc. The Batman ‘66 Anniversary Edition pinball machine will be available in Premium, Limited Edition, and Super Limited Edition models. The company has no current plans to produce a Pro model. In celebration of Stern Pinball’s 30th anniversary and Batman’s 50th anniversary, Stern Pinball will build a Super Limited Edition model. The Super Limited Edition model also includes a one-of-kind art package plus multiple translites, a unique included topper and accessories package, and a high-fidelity 3-channel audio system that is three times more powerful than audio systems of previous generations. The Super Limited Edition model will be allocated by invitation and through an application process open to pinball collectors. Collectors can apply for a Super Limited Edition model by completing and submitting an application located atwww.Batman66Application.com. Applications are due by 11:59 pm CST on September 30, 2016. The Limited Edition model will be offered in two series of 120 games each. Each game in the first series will be named for one of the 120 episodes of the television show. Each game in the second series will be named for one of the iconic “bat gadgets” used in the series. In total, only 240 Limited Edition machines will be produced. All purchasers who make a deposit on their game will also receive a VIP invitation to an exclusive “meet and greet” with Batman (Adam West) at the Westin Chicago North Shore Hotel in Wheeling, Illinois during the weekend of Chicago’s Pinball Expo. The Premium and Limited Edition models of the Batman ‘66 Anniversary Edition pinball game will be available through authorized Stern Pinball distributors and dealers around the world. Please contact your distributor or dealer for more information. The Super Limited Edition model will be available direct from Stern Pinball. Stern Pinball, Inc., headquartered just outside Chicago, Illinois, is the oldest and largest producer of arcade-quality pinball games in the world. Stern’s highly talented creative and technical teams design, engineer and manufacture a full line of popular pinball games, merchandise and accessories. Recent Stern titles include Ghostbusters, Spider-Man Vault Edition, Game of Thrones, KISS, WWE WrestleMania, The Walking Dead, Mustang, Star Trek, Metallica, The Avengers, X-Men, AC/DC, Tron, Transformers, Avatar, Iron Man and many more! All of Stern’s pinball games are crafted by hand and assembled by Stern’s expert team. A broad range of players enjoy Stern’s games from professional pinball players that compete in high-stakes international competitions around the globe to novice players who are discovering the allure of the silver ball for the first time. To join the fun and learn more, please visit http://www.sternpinball.com.